Researchers from Cambridge University developed a semiconductor assembly that acts as a field-effect light switch. Such a device could bridge the gap between optics and electronics - and lead the way towards optical spintronics. 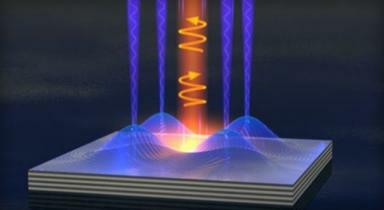 The researchers were able to "spin-encode" light so it can carry data. Light has several advantages over electrical signals at the nanoscale - and can lead to devices which are more efficient, have a larger bandwidth and are more secure. This liquid-light switch could act sort of like a nanophotonic torque converter, translating information from the electrical regime into optical signals.